Motorola has launched Moto Z3 Play Smartphone. It features a 6-inch Full HD+ Super AMOLED display powered by Snapdragon 636 SoC with 4GB of RAM and 32/64GB Storage. On Camera, it has a 12-megapixel rear camera along with a secondary 5-megapixel camera for depth-sensing AI photo features, including Cinemagraphs and support for Google Lens. Moto Z3 Play has a side-mounted fingerprint sensor for the first time. It gesture-based One Button Nav bar at the bottom, even though it doesn’t have a fingerprint sensor below the screen. 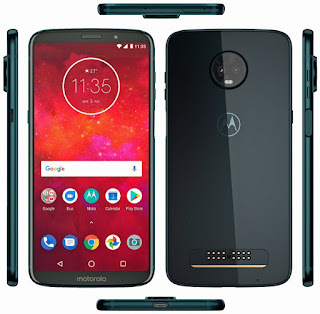 It has Moto Display, Moto Actions Packed with a 3000mAh battery with support for Turbo charging.It has Corning Gorilla Glass protection on the front and back and lightweight, aircraft-grade 6000 series aluminum frame.